I'd rather bite my hand off than watch these again!! The Viceroy: ...if the young man chooses to be difficult, there are methods other than the whip to loosen his tongue. This is the tale of a buccaneer who takes over a ship of corsairs and wreak havoc on the high seas. The pirate named Blackie(Terence Hill) join forces with Don Pedro(George Martin, also screenwriter). They square off against their nemesis, the viceroy(Edmund Purdom, Sinuhe, The prodigal) and other pirates captains(Allan Collins and Pascuale Basile, also master of arms). Blackie and Don Pedro are helped by a corpulent hunk named Moko(Fernando Bilbao) and a sympathetic pirate(habitual of Italian B series, Sal Borgese). They're going a buccaneer settlement where encounter a prisoners selling, there is slaved the viceroy's spouse(Silvia Monti). The wife is bought by Blackie, but she's freed by a ransom. Meanwhile, viceroy wishes a shipment of gold transport from Guayaquil until Spain . This is an agreeable entertainment juvenile romp. The movie displays action, swordplay, slapdash, fist-play and humor with tongue in check. This release has some nice and even hilarious moments here and there , though isn't always interesting , sometimes is diverting and fresh and on a couple of sympathetic occasions is frankly delicious. 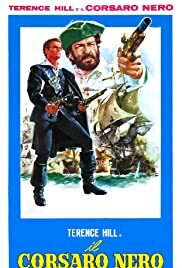 Terence Hill (Mario Girotti, Massimo Girotti'son)is cool as the pirate hero who finds dangerous situations while trying rob the shipment. This isn't the usual Hill-Spencer(Carlo Pedersoli) buddy movie, but they're contenders instead of partners, for that reason they're best known for roles in Spaghetti, 'They call me Trinity¨and followings, where they're much better. The starring are accompanied by gorgeous girls, such as Silvia Monti, Diana Lorys and Monica Randall. This adventures movie of middling budget and confuse plot, is enriched by colorful cinematography but unfortunately the copy circulating is badly printed. The motion picture is regularly directed by Lorenzo Gicca Palli, alias Vincent Thomas. He's usually screenwriter of Italian Western and adventures genre(Zorro the invincible, Hercules the avenger,Fury of Khybers) and occasionally filmmaker(Last gunfight). This standard and average 7o's Italian swashbuckling film to be liked for Hill and Spencer fans.